Apologies for the shoddy Latin. A reader has kindly helped me in my compilation of the Pope Francis Little Book of Insults, describing a particular homily as a goldmine. Thanks! I'm still waiting for confirmation from the CTS but am hopeful it will be available at some point in the future. "Children who are afraid to dance, to cry, afraid of everything, who ask for certainty in all things!" "Closed, sad, trapped Christians who are not free Christians!" "Francis has made clear his disdain for traditionalist Catholics, saying they are self-absorbed retrogrades who aren't helping the church's mission to evangelize." So Jesus turned away from Himself when He wept? Our Lady of Sorrows?... Well, I guess the papa of all things pooh-shaped will have to get Nuestra Senora de Dolorosa to sign an oath against sorrow as it belongs to a traditional drift and not the 'lavalamp church'. No more sorrow in Confession, before, during or after! No more Way of the Cross - ban that Passion. This pontificat is catholic socialist propaganda gone openly satanic. 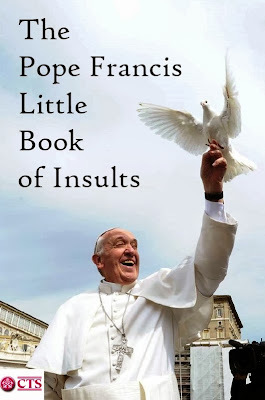 lies lies lies - this Pope is selling crazy and the world is eating it up.